Love this recipe? PIN IT to your Dinner Board to save it! 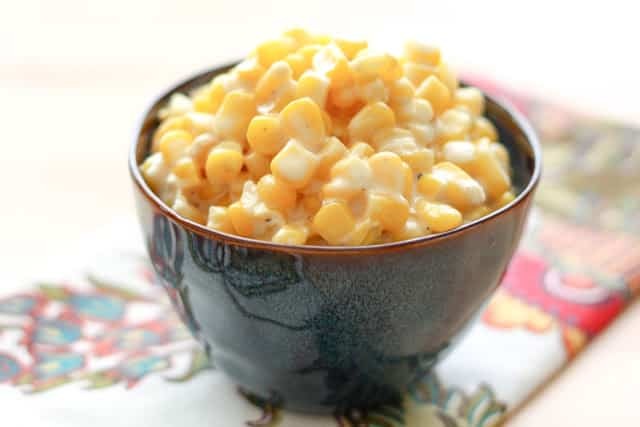 Sweet and tender corn simmers in a rich cream sauce to make this Slow-Cooker Creamed Corn. It is an unforgettable side dish like no other creamed corn I’ve ever tasted. I had no intention of sharing another holiday recipe this close to Thanksgiving. 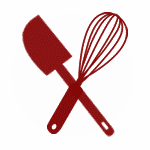 However, when I ran across this recipe yesterday, it begged to be tried and I couldn’t resist. And now, because this corn has made it to my own Thanksgiving menu for next week, I’m giving you the chance to add it to yours as well. My favorite thing about this dish is that it is made in the Crock-Pot. No watching, no stovetop, no oven space required, no serving dishes taking space in the refrigerator. It took me about two minutes to combine everything and start it cooking. Four hours later, I stirred it and served it. That pretty much makes this the ultimate holiday side dish. I tasted this around the three-hour mark and then I couldn’t stay out of it. I think I “sampled” it, just to make sure I liked it, at least ten times! It really is that good. The first bite at the table was followed by, “oh my gosh, what is in this? Wow!” My kids begged for more and the corn was an enormous hit all around. While I have trouble calling this a “vegetable side dish,” I don’t have a bit of hesitation calling it delicious. This is pure indulgence and it is perfect for a holiday table! This recipe was originally created by my friend Amber as a copycat recipe for the creamed corn at Rudy’s BBQ. I’ve been a fan of Rudy’s for years, yet I’ve never tried their corn. Perhaps I was always distracted by the suitcases filled with their barbecue sauce that I was forever hauling home? Kitchen Tip: I use this slow-cooker to make this recipe. 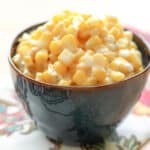 Sweet and tender corn in a rich cream sauce is the ultimate side dish.Recipe gently adapted from and with thanks to Bluebonnet Baker. Combine all ingredients in the crock-pot and cook on low for 4 hours. Stir to combine and make sure the cream cheese has completely melted into the sauce. The finished corn will hold nicely on low (or on warm, if your Crock-Pot has that setting) for another hour or two without a problem. Enjoy! This recipe doubles quite well for a crowd. Do you use canned or frozen corn? I only have 3 hrs til showtime, can I cook it on high since I don’t have the 4 hours to cook on low? Yes! It will work fine. Hi Mary, Thought it would be fun to tell you that my sister made this for the big Thanksgiving dinner at my house this year and it was a HUGE hit! I'm so glad it was a hit, Kalyn! Made this for Thanksgiving 2018 . Flavor was good but for me the leathery texture of the corn left a lot to be desired. Also the cream cheese/butter mixture was not thick enough and did not stick to the corn but sunk to the bottom of the crock. I assume there was a lot of water released from the frozen corn which made it watery. I think it would be much more successful to just an hour or so before dinner is served-- cook the corn in the microwave, ...DRAIN. Melt the cream cheese and butter in the microwave on a low power such as power 3, then whisk in enough cream to loosen the cream cheese/butter, stir into the corn and put all that in a slow cooker on warm to hold until serving. Could probably cut the cream cheese and butter in half because it would be thick enough to coat the corn. Who doesn't like cream cheese, butter, and corn? Corn should not be leathery in texture. Wow, no clue what went wrong for you, but leathery corn? That's a first. I've never had that happen or heard about it from anyone else. 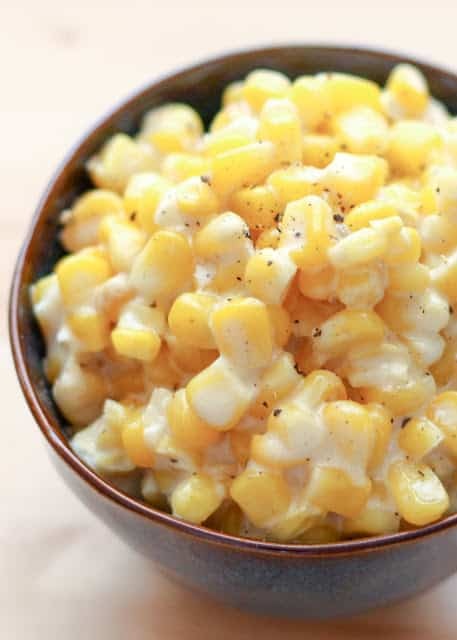 The corn should've been juicy and coated with the creamy sauce when you stirred it after cooking.